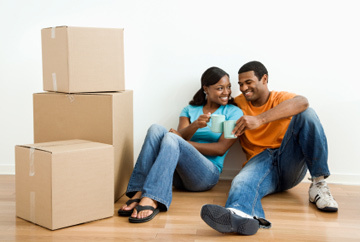 As you anxiously count down the days to your big move and prepare to pack up your belongings for the trip to your new home, it’s easy to get carried away and allow the expenses associated with moving to exceed the budget you originally set for the transition. Many new homeowners don’t realize just how expensive moving can be, and are disappointed when the total bill takes away from the money they’d rather spend on decorating their new places. Fortunately, if you follow these helpful tips, you can save hundreds of dollars on your moving costs. If you’re planning on moving into a new home soon, be sure to follow these easy steps for saving big bucks! 1. Skip on buying boxes – A wide variety of retailers sell cardboard boxes for moving, including postal offices, shipping companies and storage facilities. However, these sellers often attach a hefty price tag to their wares, and when all is said and done you could end up spending upwards of a few hundred dollars on boxes alone. Instead, opt for for free solutions by visiting your local recycling plant or asking local liquor stores and restaurants if you can have their unneeded boxes. You should be able to obtain all of the boxes you need to pack your belongings without spending a dime. 2. Pass on the bubble wrap – It’s natural for you to worry about fragile items getting broken during the move, and you may be tempted to purchase bubble wrap to ensure all of your belongings arrive in one piece. However, there are far cheaper – as well as free – ways to cushion your glass items and electronics so they don’t sustain any damage during moving. For example, you can wrap them in newspaper, or you can double up and wrap them in clothing garments, such as tee shirts. This will save you space, as well as money. 3. Move on a weekday – Most people choose to move over a weekend because of the convenience it provides, but moving companies have capitalized on this and usually charge a higher rate Friday through Sunday than they do the other four days of the week. While you might need to take an extra day or two off work, you could save a considerable sum by scheduling your move on a weekday. 4. Downsize your stuff – The more you own, the more boxes you’ll need to buy, stuff you’ll have to wrap, trips you’ll have to make and the larger truck you’ll need to transport everything. Carefully go through everything you own in the weeks leading up to your move and purge everything you don’t really use or need. You could give items away to friends and family, host a garage sale to make some extra cash or donate your gently-used goods to a local charity or thrift store. 5. Rent a Pod – Pods are portable storage containers that many homeowners have discovered are excellent for making the moving process easier. Instead of renting a truck or hiring a moving company, you simply rent a storage pod, fill it with your boxes and then wait for the company you’re renting from to pick it up. They’ll then transport it to your new house, and everything will be waiting for you when you arrive and start to settle in. LGI Homes Communities: A Great Place for Pets! Many of us at LGI Homes are proud to call our cats, dogs and other pets members of our families, and we understand how important it is for our animal-loving residents to live in a place that their pets love just as much as they do. In designing our homes and communities, we’ve included a large number of features that make our neighborhoods incredibly pet-friendly, and we’re confident that you and your four-legged friends will enjoy the many amenities your new community has to offer. Fully-Fenced Backyards – You won’t have to worry when letting your pets outside to play and spend time in the sunshine, because most of our homes come complete with fully-fenced backyards. Your dog will love having the freedom to spend time outdoors unattended or playing with your children, and you’ll love the convenience of not having to take your furry friend outside every time he needs to use the restroom. Spacious Floor Plans – All of our spacious homes provide plenty of space for your pets to roam around while spending time indoors. Cats will love having plenty of rooms to explore and nest in, while dogs will enjoy having space to sprawl out and stretch or play a little game of indoor fetch. Community Greenbelts – If your love of animals is only rivaled by your love of the great outdoors, you’ll enjoy living in one of our neighborhoods that includes community greenbelt areas – and so will your pet! You and your dog can spend countless afternoons going for long walks or playing a game of frisbee in the sunshine to let out pent up energy and take in the breathtaking scenery surrounding our communities. Walking Trails – Some of our neighborhoods include paved walking trails that are the perfect place for going on a walk or bike ride with your dog. Indeed, our neighborhoods offer no shortage of places for you and your four-legged friend to get your daily fill of exercise – all within a few short steps of your home. These trails are great for exploring with young children as well! Your afternoon walk can turn into fun for the whole family. Neighborhood Parks – If you’re looking for a place to let your children run around while taking your pet for a walk, you won’t have to look any further than our neighborhood parks and playgrounds. These are the perfect places to spend time with the entire family, as well as meet your neighbors, make new friends and check out other pets in your community. When shopping for homeowner’s insurance for your new house, it’s easy to jump and take the lowest rate offered to you by a company without reading the fine print of the policy. Indeed, not all homeowner’s insurance policies are created equally, and countless homeowners find themselves without adequate insurance protection every year when disasters or accidents occur because they failed to obtain the right amount of coverage. Before selecting an insurance provider and purchasing a policy, always ask these five questions to ensure you truly know what you’re buying – and that you’re purchasing the correct level of coverage for your home. Before you run out and purchase a homeowner’s insurance policy, be sure to read over these helpful tips. 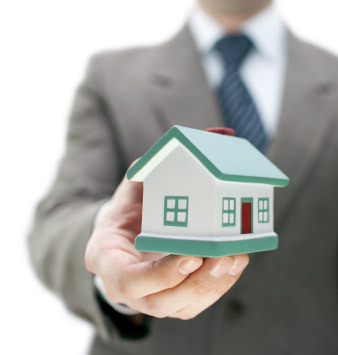 #1 How much is the personal property in my home worth if a total loss occurs? 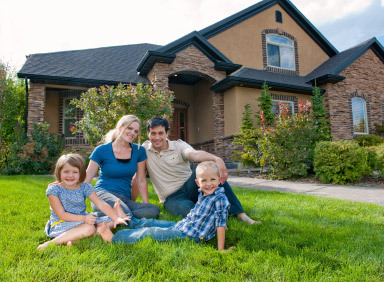 – Your homeowner’s insurance should cover your entire home, not just the walls, foundation and roof. This includes everything you’ve filled your house with to turn it into a home, such as your furniture, appliances, clothing and keepsakes. In the event that your house is burglarized or a natural disaster occurs, such as a fire, your policy should cover the cost to replace everything that is destroyed. Typically, companies provide personal property coverage equal to 50% to 70% of the amount of insurance you have on your home’s structure. Conduct a total home inventory before determining how much personal property insurance you need, and make sure you go with a company that offers enough protection to cover it. #2 Do I need a separate flood and/or earthquake insurance policy? – Most new homeowner’s don’t realize that certain natural disasters aren’t covered by typical insurance polices, and a separate policy is usually needed to cover repairs if such a disaster occurs. Most commonly, damage sustained from floods and earthquakes is not covered. Always ask companies if you’ll need to purchase two policies to receive full coverage, and don’t simply assume that your home will be protected until it’s too late. 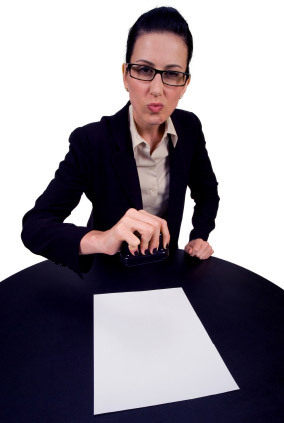 #3 How much liability protection do I need? – Liability protection is a portion of your policy that covers you against lawsuits for bodily injury or property damage caused by you, your family members or pets toward other people. This portion of your policy is meant to pay for both the cost of defending you in court and any money the court awards the person suing you – up to the limit of the policy, of course. Interestingly enough, this portion of your policy doesn’t just cover you at home, it covers you anywhere in the world. Limits usually start at $100,000, but many companies will recommend that you buy at least $300,000 in liability protection. Ask companies how much they recommend based on the amount of assets you possess. #4 How much additional living expense coverage do I get? – Standard homeowner’s insurance policies include an additional living expenses provision that pays for the costs of living outside of your home if your can’t reside there temporarily due to damage from an insured disaster, such as a fire. It covers hotel or motel bills and any other expenses over and above your typical living expenses. 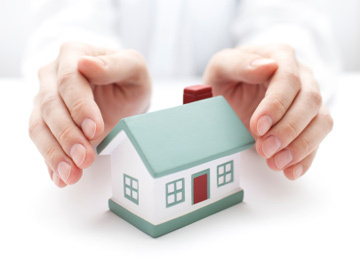 The amount of coverage varies from one company to another, but is usually equivalent to 20% of your house protection. Always confirm with a company how much additional living expense coverage is included before committing to a policy. #5 Do I qualify for any discounts? – It’s surprising how many new homeowners neglect to ask insurance companies if they qualify for any discounts before agreeing to a policy. Companies are unlikely to offer you discounts upfront if you fail to ask for them, because they want to make money just as badly as you want to save it. You might be surprised just how many discounts you qualify for on your premium. For example, most companies offer a discount to homeowners who have smoke detectors, security alarms or deadbolts installed in their homes to increase their home security. Additional discounts of up to 10% are available for homeowners over 55 years of age. Since LGI Homes are all newly constructed and feature top-of-the-line systems, you could score a discount just for having updated, modern plumbing and electrical wiring in your house. 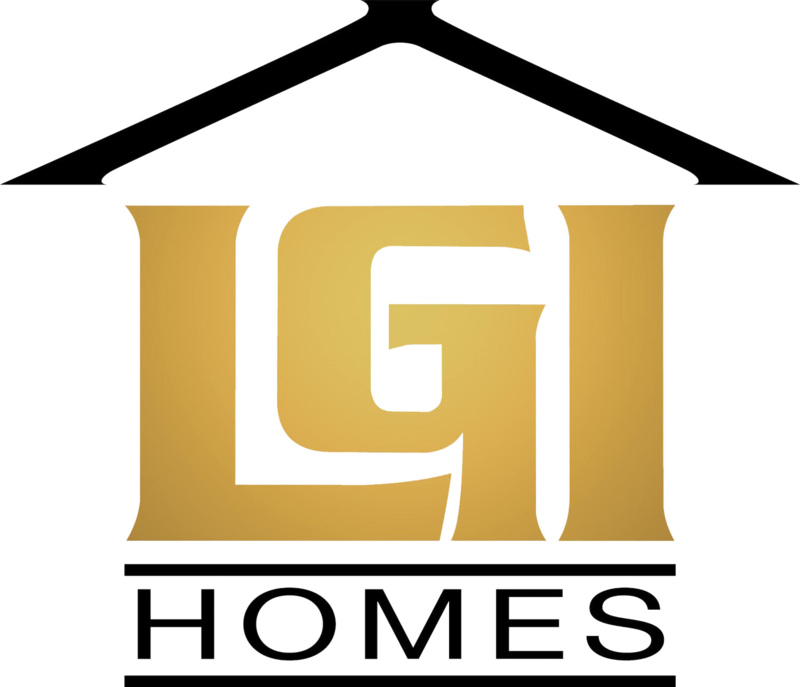 Here at LGI Homes, we pride ourselves in our tradition of superior quality – and our commitment to excellence isn’t solely limited to the award-winning houses we build. We firmly believe that every potential home buyer deserves to work with an honest, trustworthy builder, and we constantly strive to not only meet but exceed our customer’s standards when it comes to the service we provide. LGI Homes helps prospective homebuyers reach their dreams of homeownership by offering more of the resources that buyers need in today’s day in age. Whether you’ve just stumbled across our site or you’ve had your eye on a home in one of our communities for months, we offer a variety of resources to help make the home buying process as simple as straightforward as possible for you. We hope these resources will help enrich our relationship with you as a prospective buyer, and more than anything, we hope that they make your home buying experience a completely positive one. 1: Credit Counseling Program – Many of our residents once thought owning their own home was a goal they would never reach because of their credit histories, but our credit counseling program was able to prove them wrong. If you think your financial past is going to make buying a home hard in the future, let our experienced new home consultants and mortgage specialists work with you. Schedule a confidential appointment to receive a free credit report and mortgage analysis, and learn more about our service, price and value commitments today! 2: No Money Down Home Loans – Lack of a down payment is one of the most common obstacles aspiring homeowners face in the home buying process, but it might not be an issue for you! 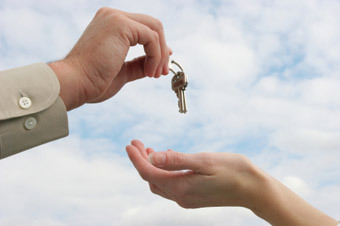 We offer no money down financing to qualified buyers, and you might just be one of them. Schedule an appointment with one of our residential experts and mortgage specialists to go over your finances and see if you qualify for a no money down home loan. There’s no commitment involved, and in the event you don’t qualify for the program, we’ll be happy to discuss other financing options that you do qualify for. 3: Online Access to Floor Plans and Neighborhood Amenity Lists – While we welcome you to visit any of our communities to see what makes us special first-hand, you can browse our floor plans and amenities through our website from the comfort of your home. 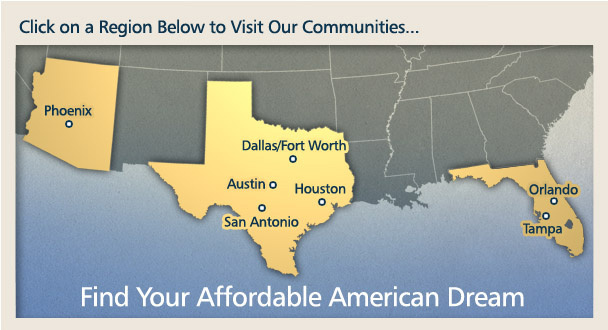 Finding the perfect home to suit your family’s needs is easy – whether you’re looking for a cozy ranch style home in San Antonio or a stately two-story in Phoenix you’ll find the right match by browsing our available inventory online. 4: Customer Testimonials – We don’t expect you to simply take us at our word when we say we’re the best company in the affordable new home market, we back up our claims by giving you access to testimonials from real people who have purchased homes from us in the past. Our customer testimonials will give your further reassurance regarding our quality and customer service, and will help you make an educated decision when deciding to buy from us. 5: Home Buyer’s Guide – The home buying process can be confusing for even the most seasoned homeowner, so it’s natural for first-time buyers to feel frustrated trying to navigate the road to buying a house on their own. From checking your credit once you decide to buy to closing once you’ve found the home of your dreams, we offer a comprehensive home buyer’s guide that covers all aspects of buying a home to help you understand what to expect. No two home buyers are alike, and everyone faces their own unique obstacles on the road to home ownership. Fortunately, there are several specialty loans available to buyers who meet certain criteria, and you might be eligible for one of them. Learn more about these specialty loan options and see if you qualify today – you could be one step closer to owning your own home by tomorrow! If you’re having difficulty obtaining a traditional loan, there may be a specialty loan program that you qualify for, including FHA, USDA, and VA loan options. FHA Loans – FHA loans are offered by the Fair Housing Administration through the United States Department of Housing and Urban Development. Many first-time home buyers decide to take out mortgages backed by the FHA, because they can obtain a down payment of as little as 3.5% – much lower than the 20% down payment required by many lenders. In order to qualify for an FHA loan, you’ll need to meet with an FHA lender to analyze your finances. They’ll compare your estimated mortgage expenses against your income to ensure the ratio does not exceed 31%. They’ll also compare your debt to income ratio, which may not exceed 43%. The FHA offers maximum loan limits which vary by state, so it’s important to research how much money you’ll be allowed to borrow before committing to a specific home. USDA Loans – USDA home loans are offered through the United States Department of Agriculture, and are targeted toward home buyers purchasing homes in rural and undeveloped areas. Outside of major metropolitan areas, the USDA considers most of the country rural. The property you want to buy must fall into a zone considered rural by the USDA, and you must meet specific income criteria to qualify for the loan. Income eligibility varies by state and county, but essentially anyone who has an income up to 115% of the median income for the area might qualify. You must be without adequate housing, but still earn enough to cover mortgage payments, taxes and insurance. All USDA loans come with a 30-year term length, and there is no required down payment involved with this loan. VA Loans – VA loans are backed by the United States Department of Veterans Affairs, and are only available to active duty military members, veterans and eligible surviving spouses. If you qualify, you can obtain a loan from a private lender, and the USDVA will guarantee a portion of the loan. This typically results in far more favorable terms for you as a borrower. You’ll get a competitive interest rate, won’t be required to front a down payment and you won’t have to obtain private mortgage insurance. It’s important to note that in most cases, you can only take advantage of a VA loan once, and after taking out one to purchase a home you won’t be able to obtain another to purchase a different property. The exception to this rule is if you pay off your VA loan in full and dispose of the property, you can have your entitlement to the loan restored. LGI Homes builds each community with the whole family in mind, which is why homes are packed with upgrades and communities are filled with amenities! #1 Plenty of Room to Roam – From spacious floor plans to large, fully-fenced backyards, our homes offer ample room for your kids to stretch their legs and play both indoors and out. #2 Access to Top Schools – Most of our communities are in close proximity to some of the top-rated public schools in their respective areas, so you’ll sleep easy at night knowing your kiddos have access to a top-notch education. Your children will pride themselves in the knowledge and skills they gain in their new schools, as well as make plenty of friends along the way. #3 Family-Friendly Atmosphere – As a whole, our communities are built with a very family-friendly atmosphere in mind, and as a result, we’ve attracted a lot of families to our neighborhoods. Your kids will have no difficulty making friends their age without ever having to leave the comfort of your new neighborhood. #4 Unrivaled Outdoor Amenities – From neighborhood playgrounds and pools to open greenbelt areas, walking trails and sports fields, all of our communities offer a unique set of outdoor amenities for the entire family to enjoy. Whether your kids want to go for a swim on a hot summer day or for a picnic in one of our open space areas, you’ll be hard-pressed to keep your kids indoors once they discover all of the fun that’s waiting outside in the community. #5 Convenient Access to Family-Friendly Attractions – A lot of careful thought and thorough planning goes in to selecting the locations for our neighborhoods, and we strive to provide all of our residents with quick and convenient access to some of the best attractions in their areas. From zoos and museums to family-friendly restaurants and parks, you’ll find plenty of fun things to do with your kids within minutes of your neighborhood. We are proud to announce that our Arizona-Division president, Chris Kelly, was recently recognized as one of the Top 40 Under 40 by Professional Builder Magazine! This is exciting news for the entire LGI Homes family, and we would like to take a moment to congratulate Mr. Kelly on this wonderful achievement and milestone in his career. Kelly has been with our Arizona division since its inception in 2011, and in the past few years he’s helped bring our company’s vision and values to families in the Phoenix area. He helped build our Phoenix division from the ground up and is currently building in three LGI Homes communities, including our Blue Hills and Glennwilde neighborhoods. Some of his achievements include leading five new sales representatives from the San Tan Heights community to 95 home closings in 10 months, as well as maintaining 100% of his 14-person staff since he started the division back in January of 2011. Kelly holds a Bachelor of Science in Engineering from the University of California Berkley, and when he’s not busy building new homes in the Phoenix Valley, he loves spending time in the great Arizona outdoors. 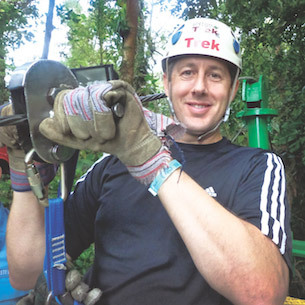 He’s an avid hiker and youth sports coach, as well as a skiier and rafter. He loves to read and enjoys traveling, and he says that South Africa is his favorite destination. He’s actively involved in a number of community programs and organizations, including the North Scottsdale Soccer Club, the Kids Love Spanish Organization, Mountain View Little League and Tempe First United Methodist Church. We’re thrilled to have Kelly as a member of the LGI Homes team, and we’re thankful for all of the hard work he’s put in to helping expand our company in the past two years. Without his efforts, dozens of families in the Phoenix area wouldn’t have seen their dreams of home ownership become a reality, and we know he will continue to help countless customers in the future. We look forward to seeing Kelly continue to grow professionally in the years to come, and would once again like to express how thrilled we are regarding this huge milestone. To see Kelly’s work first-hand, check out LGI Homes’ communities in Phoenix! Schedule an appointment with our experienced sales consultants and get started in your search for the home of your dreams. After a great deal of anticipation, you’ve finally signed the closing paperwork, unloaded your boxes and you’re getting settled into your new home. You’ve successfully overcome any obstacles that tried to hinder your home buying journey, and at long last, you can officially call yourself a homeowner. But what comes next? As a new homeowner, it’s natural to feel a bit uncertain about what major steps you need to take after the home buying process has come to an end – after all, the entire experience is new to you. Don’t wait for the initial excitement of owning a home to fade before taking care of serious business in your new place, and follow these helpful tips to ensure that everything is in order your investment in a house is protected for years to come. If you’ve just bought a new home, take a moment to read over these tips, as we’re sure they will get you started off on the right foot. 1. Get the Right Insurance – Virtually every lender requires borrowers to carry a homeowner’s insurance policy that’s enough to cover the entire value of the property in the unfortunate event of a total loss. Obtaining proper homeowner’s insurance should be on the top of your priority list as a new owner – but it’s not the only insurance you’ll need. If you’re sharing the house with family members who rely on your income to pay the bills – your spouse and children, for example – you should also consider taking out a life insurance policy with your spouse or another trusted adult listed as the beneficiary so the house isn’t loss if you pass away suddenly. Disability-income insurance is another great idea to consider, as it will help offset costs by substituting your income if you become disabled and unable to work. 2. Don’t Overspend on Decorating – Owning your home provides complete and total freedom when it comes to décor, and as a long-time renter, it’s easy to get a bit carried away with your new found freedom once you switch to owning. While you may have grand visions of a seven-piece furniture set to fill your new bedroom or a big screen TV to serve as the centerpiece of your living room wall, it’s important that you don’t go overboard and overspend on décor during your first few months as a home owner. Chances are, you spent a pretty penny out of pocket to get into your new home between your down payment, closing costs and other fees, so your savings account is likely a bit depleted to begin with. Save the big décor projects for once you’re fully accustomed to making monthly payments on your mortgage, utilities and homeowner’s insurance – and after your savings account has had a chance to recover. 3. Hire a Professional to Do Your Taxes – One of the greatest benefits of home ownership is the tax breaks, but it’s often frustrating for a new owner to figure out which deductions they truly qualify for and which ones are sure to set of red flags with the IRS. For at least your first tax season after buying, hire a professional to file your taxes and explain the rules regarding deductions to you. 4. Create an Organized Filing System – From warranty information to maintenance receipts and tax returns, there’s a lot of paperwork involved in owning a home. As soon as you’re settled, invest in a filing cabinet or a similar storage container that will help you keep all of your paperwork neatly organized. Develop a system for organizing and storing all of your important documents so if you ever need to reference a specific document you can find it quickly and easily. 5. 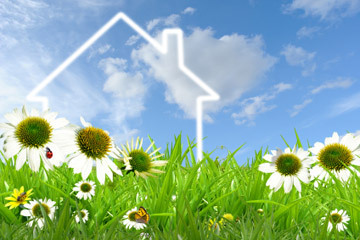 Invest Time in Maintaining Your New Home – The nice thing about moving into a new home is exactly that – it’s new! New homes require far less upkeep than older houses, but that doesn’t mean they will magically maintain themselves. You should spend time on minor maintenance projects with the change of every season to maximize the life of your home’s internal systems and appliances and keep it looking great for years to come. LGI Homes offers a comprehensive seasonal maintenance checklist for our residents, which you can find here. Last Chance: Village of Decker Oaks is Filling Up Fast! UPDATE: SOLD OUT! Click here to view similar neighborhoods. If you’ve had your eye on a home in the Village of Decker Oaks, now is the time to act because the neighborhood is about to sell out! Our available inventory is quickly filling in, and it’s no wonder why! Village of Decker Oaks is one of the best and most affordable new home communities in the Tomball area, and we’re sure you’ll love the many features and amenities we’ve included in every home in the neighborhood. Situated in Montgomery County, Texas, the Village of Decker Oaks is the perfect place to call home. Whether your a newlywed looking to start a family or you’ve already got a few little ones running around, the community offers floor plans to fit every family size and lifestyle. Choose from a selection of three, four and five bedroom floor plans, all complete with utility rooms and two-car garages. We include over $10,000 in state-of-the-art, luxury upgrades in every home in the neighborhood – all at no extra cost to you! You’ll love experimenting with new recipes in your kitchen that features quality appliances, granite counter tops and custom cabinets. Your children and pets will have ample room to roam around because all of our homes feature oversized lots, and you’ll rest easy allowing them outside to play in your new fully-fenced backyard. We strive to make the exteriors of our homes as beautiful as the interiors, so your new home will come complete with gorgeous front-yard landscaping you’ll love showing off when friends and family stop by to visit. The Village of Decker Oaks provides quick and easy access to the city of Houston, so commuters will enjoy a quick drive to work without having to live in the traffic and noise of the city. Other nearby attractions include the Texas Renaissance Festival, Klein Memorial Park, Augusta Pines Golf Club, the George Mitchell Nature Preserve and a wide variety of shopping and dining opportunities for the entire family to enjoy. Don’t let the chance to live in this stunning, Tomball area community pass you by. Check out our available home inventory online or call LGI Homes today to see how we can help make your dreams of home ownership a reality. From our confidential credit counseling program to our no money down home loan option for qualified buyers, we can make the process of purchasing your first home in the Village of Decker Oaks convenient and easy. As a home buyer, you probably plan to finance at least part of your house by taking out a mortgage. Obtaining a home loan can be a daunting experience as it is, but unfortunately, a number of predatory companies have popped up over the years to complicate matters even more. While predatory lenders are typically small, unlicensed businesses who target their scams toward inexperienced buyers with poor credit, even large, reputable banks have been found guilty of using predatory lending practices. While you’re shopping for a lender to help make your dream of home ownership a reality, follow these tips to ensure you don’t get ripped off and fall victim to a common lending scam. Innocent homebuyers are regularly being taken advantage of by predatory lending scams. Don’t fall victim by following these tips. 1) Look Out for Loans That Start With Interest Only Payments – Some lenders might try to get you to agree to a loan term that begins with interest only payments, but this is highly problematic for you as a borrower. Such loan terms often look beneficial at first glance through the eyes of a borrower, because the initial payments are low. However, when you enter into this sort of agreement, you won’t make any progress toward paying off your principle balance for the duration of the interest only payment term – meaning your ultimate goal of owning your home fully will be even further postponed. The monthly payment on interest only loans also tend to skyrocket over time, so while the low payment may be attractive to you today, you might not be able to afford your payment at a later time. 2) Check for Early Payment Penalties in the Fine Print – Some homeowners want to pay off their mortgages as quickly as possible, and some lenders will do anything in their power to prevent them from doing so. Check with potential lenders to make sure they do not include penalty fee in the fine print of their contracts that will prohibit you from making extra payments toward your loan to reduce the amount of interest you have to pay. 3) Stay Away from Lenders With Excessive Upfront Fees – A good rule of thumb as a borrow is that the amount of upfront fees a lender charges is highly indicative of how unfriendly their general loan terms will be. If a lender is out to squeeze every penny they can from you from the moment you start negotiating a mortgage rate with them, you can rest assured that they will nickle and dime you through the duration of your loan term if you borrow from them. 4) Avoid Lenders That Try to Push You Toward Options You’re Not Comfortable With – As a borrower, you do need to be a bit flexible in regard to your interest rate and term length in order to reach an agreement with a lender. However, this doesn’t mean you have to let a lender walk all over you or force you into an option you aren’t comfortable with. If a lender keeps pressing you to agree to a specific option no matter how many times you state that you don’t want to go with it, it’s time to meet with another lender who will be more willing to work out a deal that benefits you both. 5) Obtain a Copy of the Exact Loan Terms at the Time of Signing – Believe it or not, some lenders will ask you to sign a mortgage agreement and then refuse to give you a copy to keep for your own personal reference. If a lender refuses to give you a copy of the exact loan terms at the time of signing, put down the pen and find another lender. Remember that LGI Homes offers a credit counseling program for buyers, so we can work with you to help you achieve a real deal on your mortgage. Our free, confidential program will help bring you closer to your dream of home ownership, and our experienced mortgage specialists can help find the perfect home loan to finance the home of your dreams.